Meet the Ant-Man! Not him. No, not the other one. DC’s Ant-Man! What lies beneath the mask of the pint-sized peril? He’s the mighty mite, a six-inch dynamo with the weight and density of a full-grown man, the small scourge of crime everywhere. You’re probably thinking of Marvel Comics’ Hank Pym right about now. Or maybe you’re guessing it must be his successor, Scott Lang, who recently received the big-screen treatment and was hilarious. Sorry. 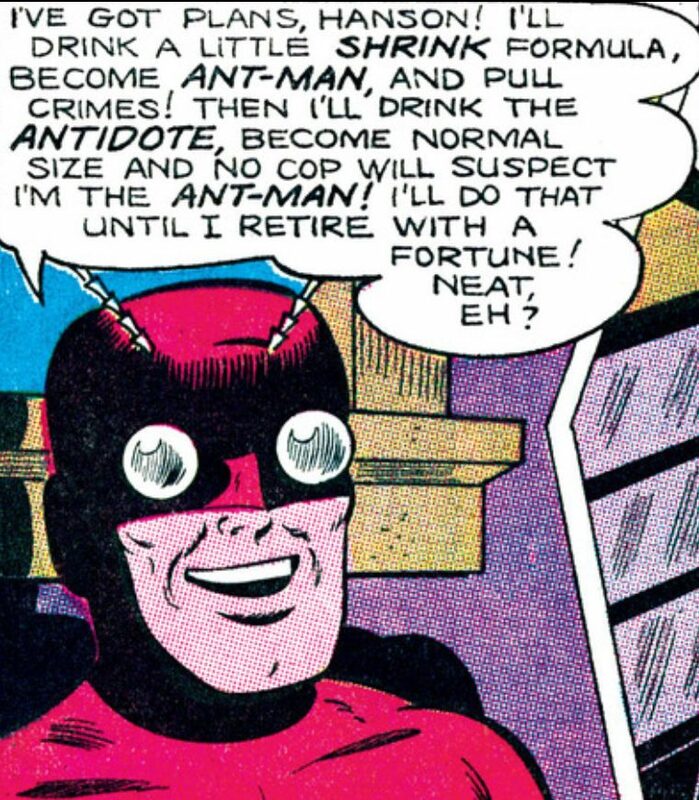 This is DC’s Ant-Man – a character who made but one appearance in “Batman” No. 156, cover date June 1963. 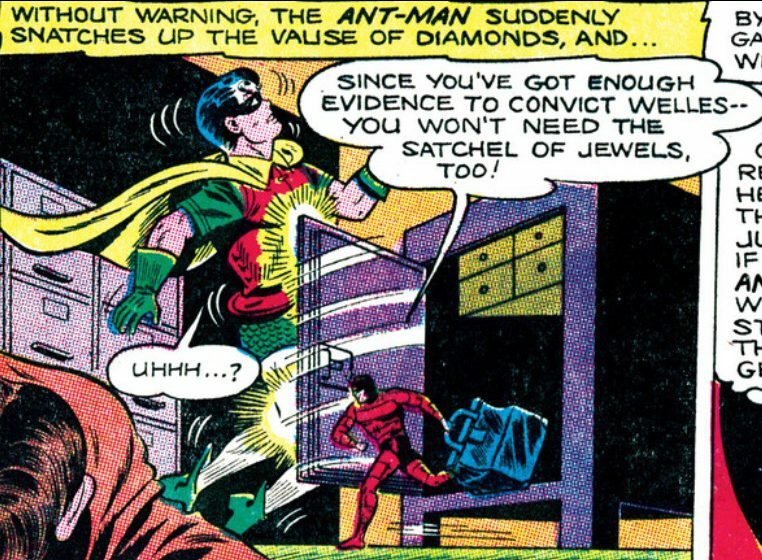 In “The Secret of the Ant-Man,” written by the amazing Bill Finger and illustrated by the dynamic Sheldon Moldoff, Robin discovers a new crime-fighter on the scene – the mighty but minuscule Ant-Man, who helps him thwart a robbery. 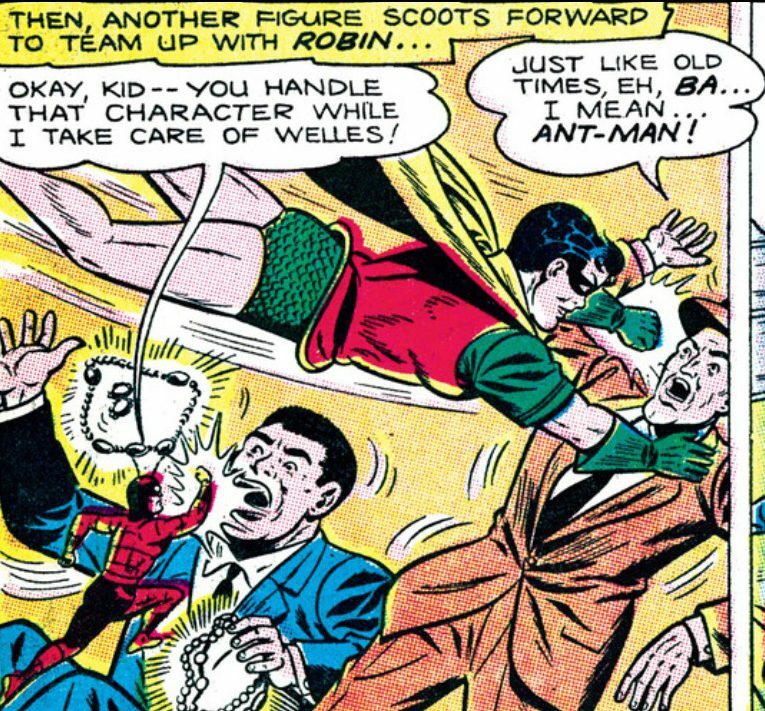 So I am guessing Ant-Man is pressing all 190 pounds on the sternum of this hapless hood. The masked mote makes the most of his entrance, dropping the kind of dialogue that lets us know exactly who he is. But just as quickly, the Ant-Man yanks off a ventilation panel and makes his escape. Who is this diminutive dynamo? Could it be … Batman? 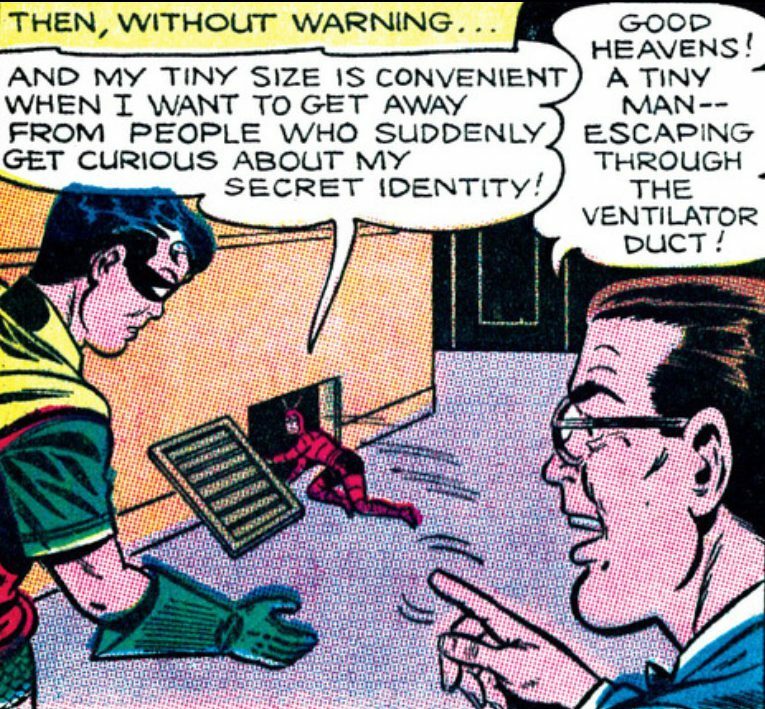 It would be just like Batman to shrink himself down to next to nothing just to prank the Boy Wonder. Robin, along with his best pal, Ace the Bat-Hound, sleuths his way to the riverfront laboratory of Professor Hanson, who has been working on an experimental formula to shrink living tissue. Ant-Man: Ruining the reputation of insect heroes everywhere. 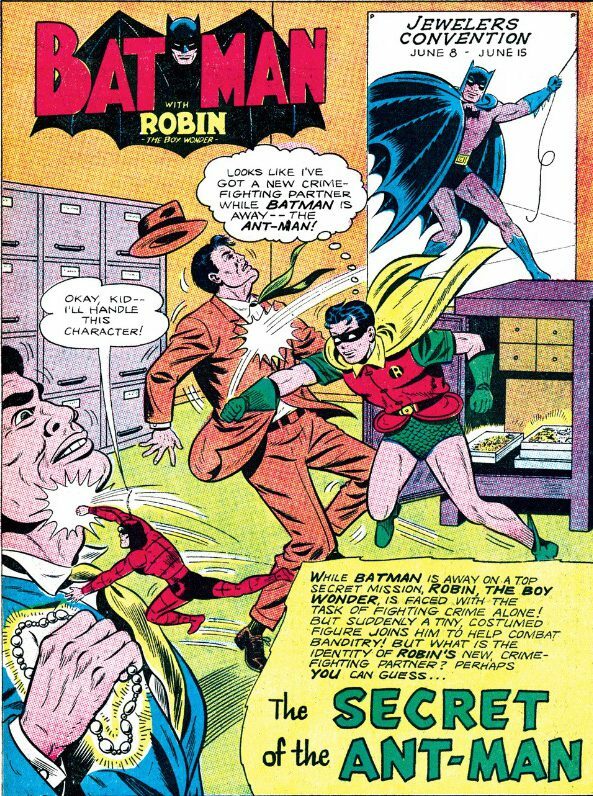 Not long after, Robin interrupts another gangland robbery and is joined by the Ant-Man. But pint-sized pugilist pulls a fast one and makes off with the jewels. That night, the Gotham Gazette runs a front-page story revealing Hanson has found an antidote to his shrinking formula. Ant-Man pops up and reveals he’ll use the shrink formula to steal and the antidote to become normal and no cop can ever stop him. How about a robin-sized Robin, shrunk to fight him? Sure, he promises to stop, but can you really give up the small life? Once captured, the Ant-Man is unmasked. He’s actually gangster Jumbo Carson, who was believed murdered by his associates, but when he fell into the nearby river, Hanson’s chemical spill-off turned him into the sly sprite. Side note: These scientists sure are reckless when it comes to the environment. The Gotham City branch of the EPA must be on call 24/7. And the story has a happy ending when Robin reveals to the scant scamp that there is no antidote to the shrinking formula. “Professor Hanson hasn’t perfected it yet,” he says. And all’s well that ends well – wait, is that guy still stuck at six inches? Once a bug, always a bug? 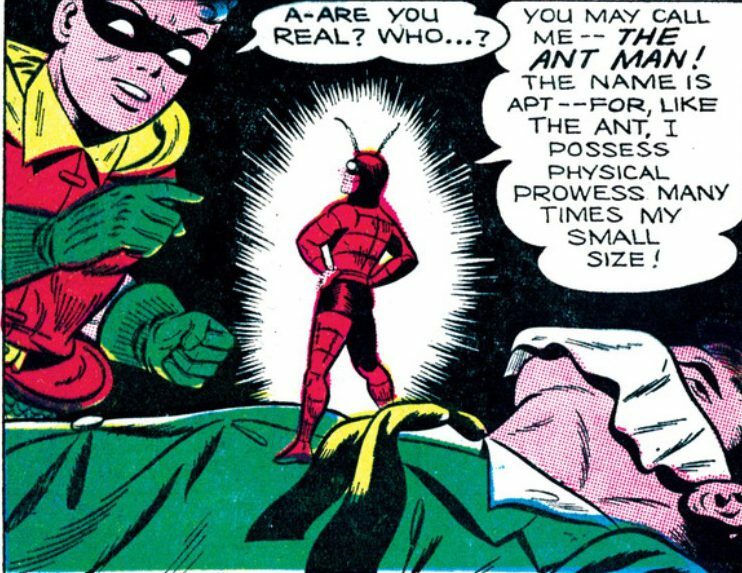 Marvel’s Ant-Man – Hank Pym – made his first appearance in “Tales to Astonish” No. 27, cover date January 1962. Given the six months between reported publication dates, it’s certainly possible DC knew of Marvel’s diminutive daredevil, but it’s hardly conclusive. Marvel arrived first, and DC didn’t go any further with its villain. DC already had its mighty mite with the Atom, who made his Silver Age debut in “Showcase” No. 34, cover date October 1961. Ray Palmer was able to shrink to sub-atomic size using the remnants of a dwarf star. 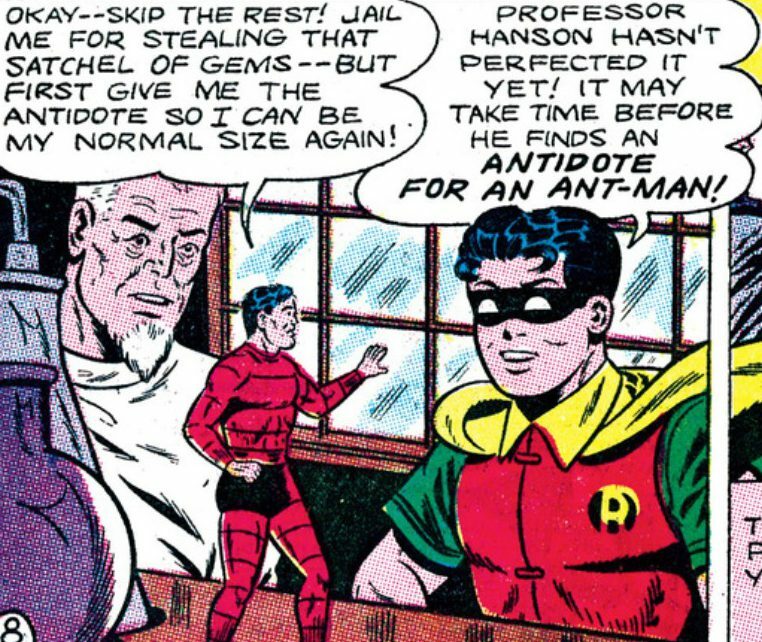 What could have been, if only he stayed good: Robin and his sidekick the Ant-Man. But I have to admit, a size-changing villain does have enormous potential to create havoc. We saw that briefly with Atomica’s run in “Justice League” before she was stamped out – literally – by Lex Luthor. DC’s Ant-Man is still out there somewhere. He survived the Crisis on Infinite Earths, Zero Hour, Identity Crisis, Final Crisis, the New 52, the DC Rebirth and those terrible “Star Wars” prequels. It’s taken him over 50 years, but he’s managed to make his way two blocks and down an alley. Beware, Batman! If you ever venture into that alley, the Ant-Man is going to trip you but good. I love the whimsy of the silver age. The Atom was always one of my favorite heroes. I don’t believe that DC can even be bothered with the Atom in this current bloated age. The more I read Silver Age stories, the more I am impressed with how tightly plotted they are. This Ant-Man story runs eight pages. If this story were to be told today, it would be stretched for six issues so it could fit a trade. Maybe it’s because I’m 5’5″, but I’d say good guys come in small packages.